The girl we know as Malinche was born in 1502 on the 12th day (probably in May) under the sign of Malinalli or ‘Grass’. The 12th Day of the Aztec tonalpohuall calendar is Malinalli (Grass) and is governed by the god Patecatl, the Lord of the Land of Medicines, a deity of healing and fertility. This day signifies tenacity, rejuvenation, that which cannot be uprooted forever. Malinalli is a day for persevering against all odds and for creating alliances that will survive the test of time. It is a good day for those who are suppressed, a bad day for their suppressors. When Malinalli was given to Cortes in 1519 as one of twenty slaves, he insisted that all the girls be baptized and the name selected for Malinalli was ‘Marina’ either because she was discovered close to the sea or because it sounds like Mary after the Virgin Mary. Because Malinalli’s manner was refined and regal, the Spanish added the honorific ‘Dona’ and so in Spanish texts she was referred to as ‘Dona Marina’. 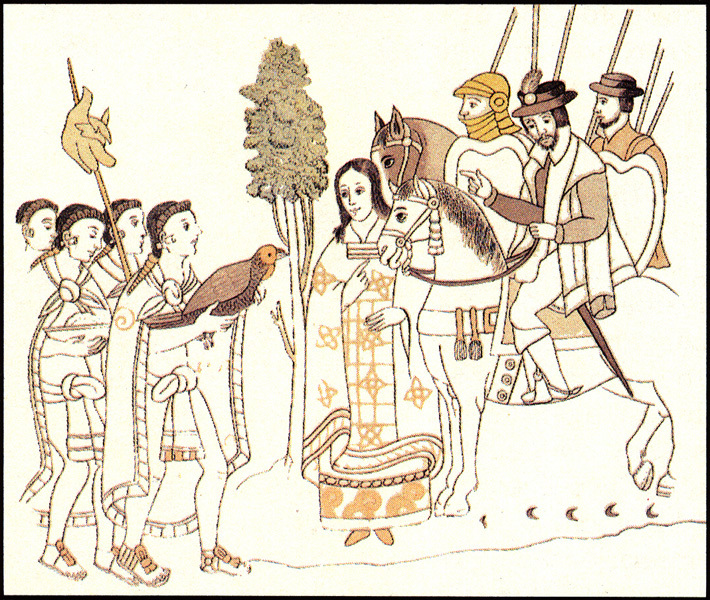 Later when Malinalli acted as interpreter for Cortes, the natives added their own honorific ‘che’ and called her Malinche. The natives considered her and Cortes as one voice and so called both of them ‘Malinche’, distinguishing between them only by adding La to Malinche and hence the name she is known throughout history: ‘La Malinche’.